May 24, 2016 (New York, NY) – Today, The Julia Child Foundation for Gastronomy and the Culinary Arts announced that Chef Rick Bayless is the recipient of the second annual Julia Child Award. The 2016 award will once again be presented at the Smithsonian’s National Museum of American History at a gala October 27, 2016. The award is accompanied by a $50,000 grant from the Foundation to a food-related non-profit selected by Chef Bayless. 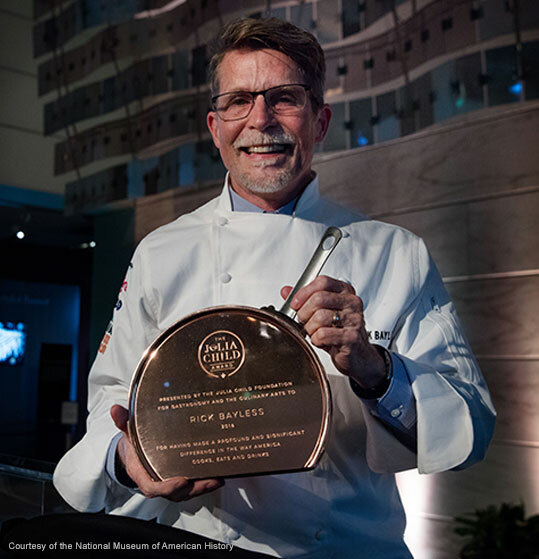 “Rick Bayless represents everything the Foundation sought to recognize in creating this Award. We applaud Rick’s achievements as an industry leader and a humanitarian who has championed educating Americans about Mexican cuisine just as Julia did with French cuisine. The Foundation is delighted the Award’s grant will enable Rick’s foundation to expand its valuable work,” said Eric W. Spivey, Chairman of The Julia Child Foundation for Gastronomy and the Culinary Arts. Chef Bayless was chosen by an independent jury for his accomplished work as a chef, restaurateur, author, television personality, environmental advocate, and philanthropist. He has selected the Frontera Farmer Foundation to receive the $50,000 Award grant. The Frontera Farmer Foundation, a 501 (c)(3) nonprofit organization founded in 2003 by Chef Bayless and his team, is committed to promoting small, sustainable farms serving the Chicago area by providing them with capital development grants. The money will be used to help further the Frontera Farmer Foundation’s mission to help support small Midwestern farms and sustainable regional cuisine. The Award will be presented to Chef Bayless by esteemed journalist Scott Simon of NPR’s Weekend Edition during the gala, which kicks-off the second annual Smithsonian Food History Weekend. The gala will be held at the National Museum of American History in Washington, D.C. on October 27, 2016 and supports the Museum’s American Food History project. Click here to purchase tickets. Created by Julia Child, the Foundation has become one of the leading grant-giving private foundations solely dedicated to supporting the field of gastronomy and the culinary arts. In 2015, the Foundation established the Julia Child Award to continue to foster Julia’s legacy, while also honoring an individual who has made a profound and significant difference in the way America cooks, eats and drinks. To learn more about the Foundation and its work, please visit: juliachildfoundation.org. To learn more about the Julia Child Award, please visit: juliachildaward.com. Information about the Smithsonian’s second annual Food History Weekend and tickets to the October 27 Gala can be found at: http://s.si.edu/FoodHistoryWknd. About The Julia Child Foundation for Gastronomy and the Culinary Arts The Julia Child Foundation for Gastronomy and the Culinary Arts was created by Julia in 1995 and became operational in 2004. Its mission is to honor and further Julia’s legacy, which centers on the importance of understanding where food comes from, what makes for good food, and the value of cooking. Headquartered in Santa Barbara, California, the Foundation is a non-profit which makes grants to support research in culinary history, scholarships for professional culinary training, internships in food writing as well as professional development and food literacy programs. Over the last decade, the Foundation has made more than $1.25 million in grants to other non-profits. For more information, visit: juliachildfoundation.org. Many may know Rick Bayless from winning the title of Bravo’s Top Chef Masters or from his highly rated Public Television Series, Mexico–One Plate at a Time. The show, which just wrapped its 11th season, helped him get nominated for a Daytime Emmy in 2012 for Best Culinary Host. Over the years Rick has received numerous awards and accolades, including: the Humanitarian of the Year by the IACP for his many philanthropic endeavors; seven James Beard Awards; as well as the Mexican Order of the Aztec Eagle by the Government of Mexico – the highest decoration bestowed on foreigners whose work has benefitted Mexico and its people. In addition, he’s written nine award-winning cookbooks: Mexican Kitchen, Mexico–One Plate at a Time, and Fiesta at Rick’s, amongst others. His award-winning restaurants are in Chicago and include: Frontera Grill which received the James Beard Foundation’s highest award, Outstanding Restaurant, in 2007; the 4-star Topolobampo (1991); the LEED GOLD-certified, fast-casual Xoco (2009) his quick-service Tortas Frontera and Frontera Fresco. In May 2016, Rick opened Leña Brava and Cruz Blanca Cervecería. Rick and his staff established the Frontera Farmer Foundation in 2003 to support small Midwestern farms. To date, the Frontera Farmer Foundation has awarded nearly 200 grants totaling nearly $2 million. In 2007, Bayless and his team launched the Frontera Scholarship, a full tuition scholarship that sends a Mexican-American Chicago Public School student to Kendall College to study culinary arts. Through programs, research and collections the Smithsonian Food History project at the National Museum of American History invites communities near and far to come to the table. By learning more about American food history, today’s Museum visitors will understand the role they play in shaping how and what America eats. Food programs are based in the rich food history content at the National Museum of American History and include a diverse menu of programs and demonstrations that bring visitors together for relevant discussions that start with history and expand to the present and future of American food. These activities include weekly free daytime programs for millions of museum visitors each year, regular “After Hours” evenings that mix historic topics with delicious food and drinks and the annual Smithsonian Food History Weekend. As the home of Julia Child’s kitchen, the National Museum of American History is committed to examining the impact of food, drink and agriculture on American History. Join us around the table and learn more at http://s.si.edu/FoodHistory.